My girls like to do face painting from time to time. With Community Days, Fairs, and other events coming up my oldest daughter living home helps with face painting. She will be doing face painting at one of the community events next week and then again at the fair so we picked up some face & body paint to have on hand for our own use and for her to practice with so she is ready. 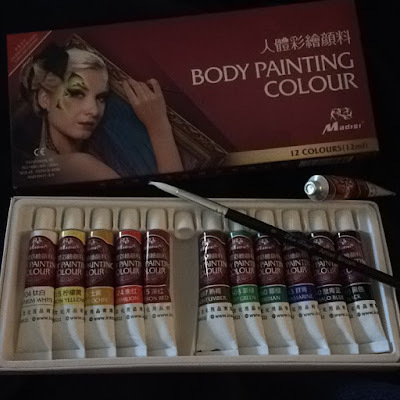 This face & body Paint from iMustech is nice because each color is safe inside sealed 12ml tubes that can be closed with tubes and aren't open to the elements in between uses. iMustech also includes a nice paint brush for applying the face & body paint, although my daughter uses several items to get the effects she personally wants or is creating on someone's face. The colors in this set of 12 are lemon yellow, burnt umber, vermilion, sap green, viridian, phthalo blue, titanium white, crimson red, ultramarine, burnt sienna, yellow ochre, and black. The best part about these face & body paints is that they are not drying, they are actually moisturizing. With other sets we have had I have always put cold cream or moisturizer on my children's faces before beginning. I just makes a nice pallet and helps with easy clean up when you are ready to remove. I also like that this paint does not crack when it is drying, showing the importance of moisturizing effect. Last but not least is that these face & body paints are safe and non toxic. I can't rate them as vegan, which is the only thing I can see that would make them great for everyone. The iMustech face & body paint set can be found at my affiliate link below. Disclosure: MarksvilleandMe received one or more of the products mentioned above as part of a promotion with Tomoson and iMustech. Regardless, MarksvilleandMe only recommends products or services we use personally and believe will be good for our readers. Some of the links in the article may be “affiliate links.” This means if you click on the link and purchase the item, I will receive compensation. If you would like MarksvilleandMe to review or promote a product or service please contact us at marksvilleandme@gmail.com.